Are you looking for a delicious vegetables recipe with a difference? If you are, you’ve found it! 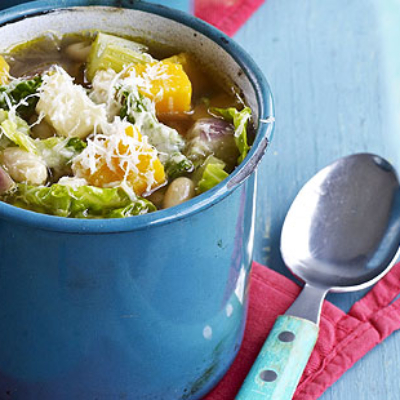 Here’s my chunky winter vegetable and cannellini bean soup for you to enjoy. I created this soup when I was cooking for friends who are vegetarian and they all watched me and wrote down the recipe so I figured if they were impressed, hopefully you will be too. I have used six different kinds of vegetables to make the wholesome soup you’d expect but the bread, cheese and beans give it an even more rustic feel. It’s the perfect evening family meal or a great starter for friends (do ensure you serve small portions as a starter as it’s extremely filling). 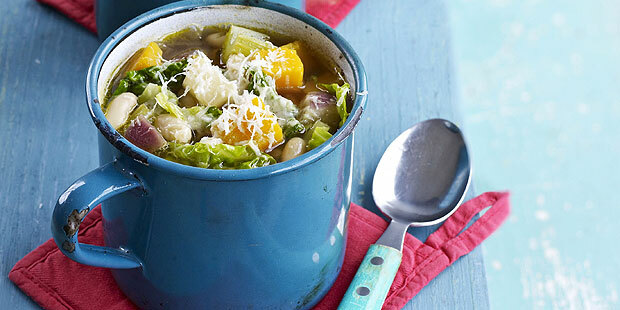 Feast your eyes on the finest chunky winter vegetable and cannellini bean soup! It’s straightforward and fun to make this great dish. Simply follow the instructions below and get the perfect result. Heat the olive oil in a large saucepan and fry the onion, carrots, turnips, celery, cabbage and bay leaf for 5 minutes until golden, stirring occasionally with a wooden spoon. Pour in the vegetable stock and gently simmer for 20 minutes, stirring occasionally, until all the vegetables are soft. Add the beans and the pumpkin, season and continue to cook for a further 15 minutes. Stir in the parsley and allow to rest for 3 minutes. Preheat a griddle pan. Toast the bread on the griddle pan for about 2 minutes on each side until golden and crispy. Immediately lightly rub with the garlic on one side only. To serve, place a slice of bread in 6 warm serving bowls and pour over the soup. Sprinkle with Pecorino and serve immediately. 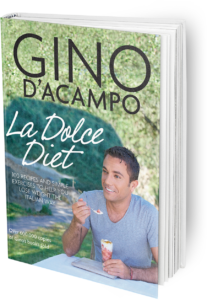 Once you’re done, simply sit back and enjoy your chunky winter vegetable and cannellini bean soup and don’t forget to check out other great authentic Italian recipes including great antipasti recipes, Italian pasta recipes, Italian soup recipes, Italian beef dishes and authentic pizza recipes.